● Rust development can be prevented for 2 weeks ~ 4 months via soaking and dabbing method which is then dried naturally in a room after the treatment. ● After drying, paint coating can be done immediately. ● It is not harmful to the body and work can be done safely. Dilute 1 part of concentrated ER-G3000 to 9 parts of water. After removing rust with RSR-2, wash it off with plenty of water. Soak or dab with the pre-diluted ER-G3000. Leaving it in a room will suppress development of rust for 2 weeks ~ 4 months. If paint coating is required, it can be directly done so. After removing rust with RSR-2, wash it with plenty of water. Pour in pre-diluted ER-G3000 into the fuel tank. Stir it all around to spread the solution evenly. Drain the solution out and dry the fuel tank naturally. 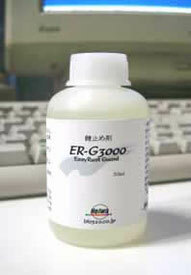 ★ ER-G3000 is water-soluble. Effectiveness will be poor if it is rained upon or wet with water after the treatment. ★ After soaking or brush painting, do not wipe it off but instead let it dry naturally. ★ Anti-rust sustainability varies depending on environment. 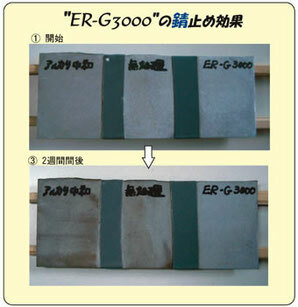 ★ ER-G3000 is exclusively used for iron and stainless steel.